This is a slightly longer version of an article that was originally published on January 4, 2010, in the Shenzhen Daily. Meilin Park is a great place to spend an afternoon. Located against the hills next to Meilin Reservoir, the park contains over a thousand litchi trees more than 100 years old. There's an area dedicated to senior activities, a children's playground, an exercise area, ponds, and plenty of strolling paths. The first is the "Four Seasons Square." China's use of the lunar calendar is widely known; less well-known is that there is an alternate, sun-related calendar originally used largely in farming. It consists of the 24 jieqi (节气) or "solar terms." The somewhat-well-known Qingming Festival in April is actually the beginning of one of these terms. 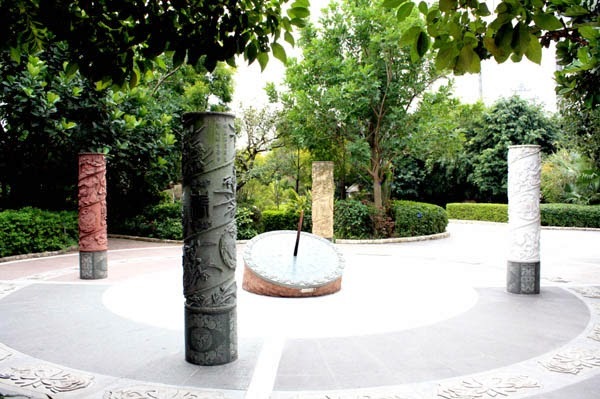 Meilin Park's Four Seasons Square has a large calendar, with a sort of sundial in the middle, and 24 divisions with the Chinese characters for each solar term around the edge. One term, for example, runs from about Dec. 6 to 21, and is called "Heavy Snow" (daxue 大雪). No snow here, of course; but the calendar was developed in the Yellow River Valley, much farther north! 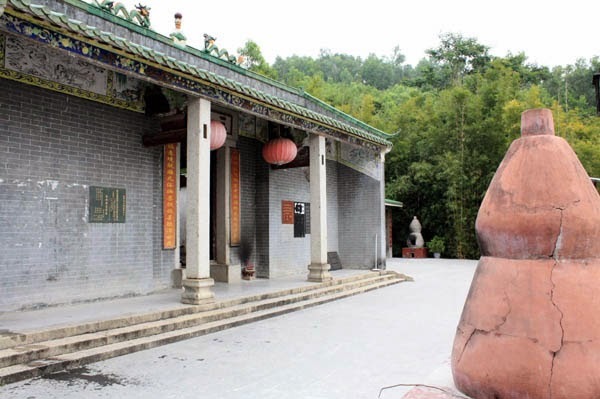 On up the hill is the San Sheng Temple, dedicated to three "sages" who appeared to a local man 300 years ago. The temple was destroyed three times, the last one being for road construction, when it was moved to the park. A small Earth God hall stands next to the temple, and another building behind houses discarded statues, next to a small pool. To get there: Start at the main intersection in Meilin (Meilin Yicun梅林一村bus stop, served by many buses, including 374 from the Central Business District). Walk north (away from the city) with Carrefour on your right; you'll see the large white Chinese character for water (水) on a green background. Turn right at the third guard gate (a sign next to it says "139岗"). Walk past a school, and the west gate to the park will be on your left. Follow the car-width road up the left (west) side of the park; Four Seasons Square will be on the left. Continue up the hill to find the temple. grave goods in the foreground and a small Earth God hall beyond. 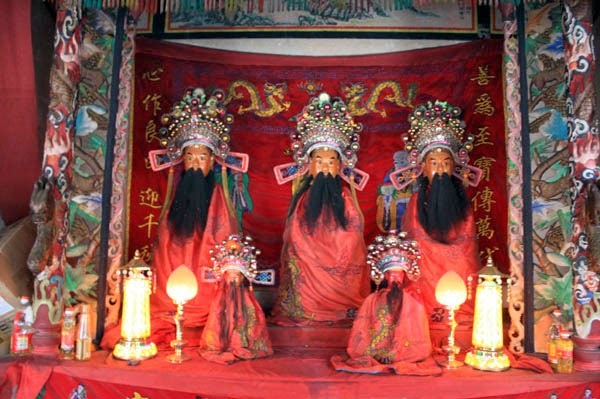 Wu (Mo), civil and martial gods who are very popular in South China.